The 2017 Delfest lineup has been announced! 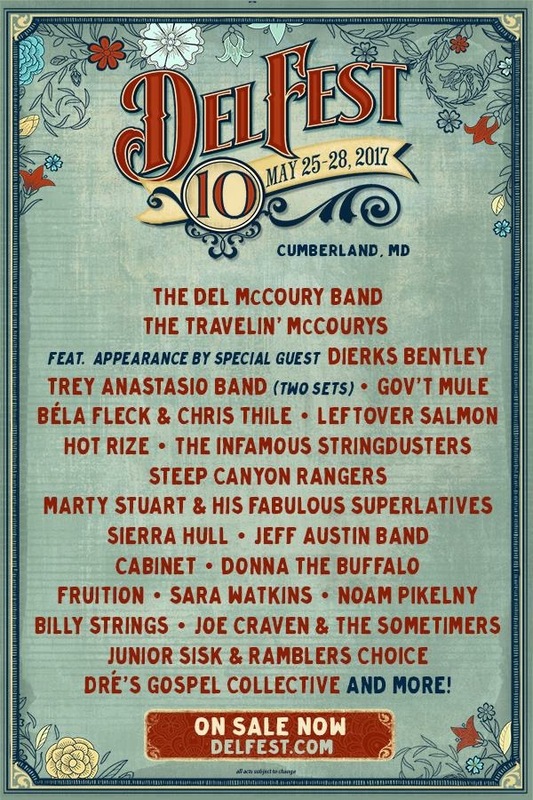 This year’s 10th annual Delfest will take place Memorial Day weekend at the Cumberland, MD fairgrounds. This year’s festival boasts another stellar lineup of music. The festival begins with its Del Academy the week prior to the music, which will run May 25-28th. The festival will kick-off its return with the Del Academy, held May 21-24th. The academy is an intensive music learning experience with some of the finest bluegrass musicians as instructors. You can ​purchase academy tickets here​. Musicians of all ages and ability are encouraged to attend. times throughout the weekend with the Del McCoury Band. Gov’t Mule will be making its debut this year, and upstate NY natives and ​Finger Lakes Grassroots Festival​ creators, Donna The Buffalo will return this year; having not appeared since the 4th annual Delfest in 2011. The lineup this year will also include: ​Béla Fleck & Chris Thile, Leftover Salmon, The Infamous Stringdusters, Steep Canyon Rangers, Sierra Hull, Jeff Austin Band, Cabinet, Joe Craven & The Sometimers, Hot Rize, and many more! This festival has rightfully been tagged the family-friendly festival of the season by those who have attended in previous years because, DelFest doesn’t just offer family camping areas, they offer a complete family vacation experience where children are encouraged to join their music lovin parents for a weekend of arts & crafts, jambands and bluegrass. All ticketing info and available camping options can be found on their website at ​www.delfest.com​.